Sepu badi or Mukund Badi is one of the key dishes of Kangra and Mandi Dham(Lunch served in traditional marriage). Sepu badi Madra is one of the most sought after starter. 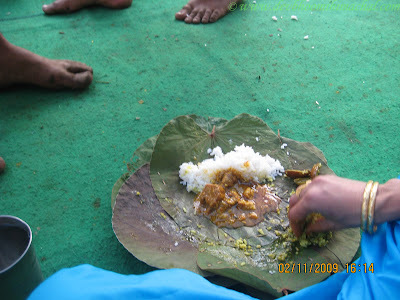 In order to prepare 'Sepu Badi Madra' you need Sepu badi(Mukund Badi). You can get 'Sepu Badi' from shop or you can prepare it at home too. 'Sepu badi' can be prepared from ground mixture of Mah(Urad) dal and Chana dal soaked overnight. This ground mixture is boiled in water after wrapping in some big leaves (Turmeric leaves can work) and cut into pieces and finally fried. Take few pieces of 'Sepu badi', fry them if they are not fried. Add edible oil to a pan and add curd to it (250 to 300 grams will be enough if you are going to cook for 2-4 people). Make sure that curd is not very sour . Cook the curd till the time water dries off and a thick paste of curd separated from oil appears. Now add red chili powder, coriander powder, methi powder, garam masala, haldi and salt. Mix it well. After this add the sepu badi and water as much you feel will be sufficient. Cook for 20-30 mins, keep stirring and serve hot with rice. You can also add the paste of mashed palak and tomato puree, ginger, garlic to this if you want to make it more thick and flavoured.